I promised last week that I would do a separate post for the decorations from my birthday party. It’s taken me so long to make good on that promise because when I reviewed the photos, most of them were not that good terrible. I will post the best of the worst and hope you forgive me for doing this to your eyes. I had originally planned on wearing a hot little turquoise, black and silver number for the party. 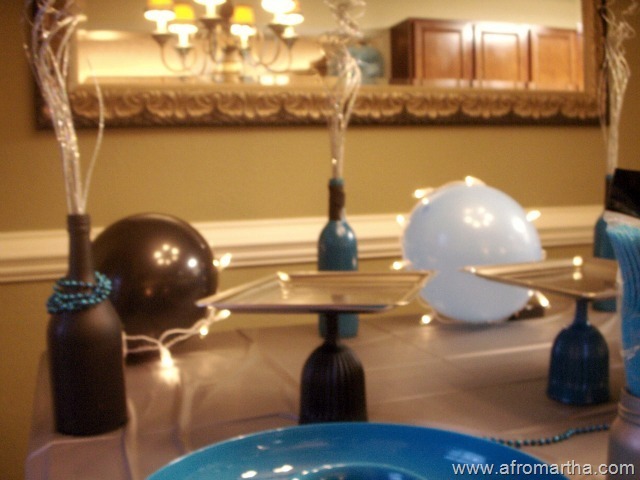 I just loved the colors together and decided that would be the color scheme for the decorations. I don’t know if it was because of being immersed in all that turquoise black and silver, but I just could not bring myself to wear the outfit. I just wasn’t comfortable in the outfit, and I wasn’t sure I wanted to match the décor. Not only did I not wear that outfit, I didn’t even take it with me on the trip. I retained the color scheme though! *Silver and turquoise faux-mercury glass votive cups (my sis-in-law thought these were shot glasses, hehehe. I had to break it to her that this was not that kind of party) + votive candles. Be sure to place in a safe place where no one will knock them over, causing your party (amongst other things) to go up in flames. 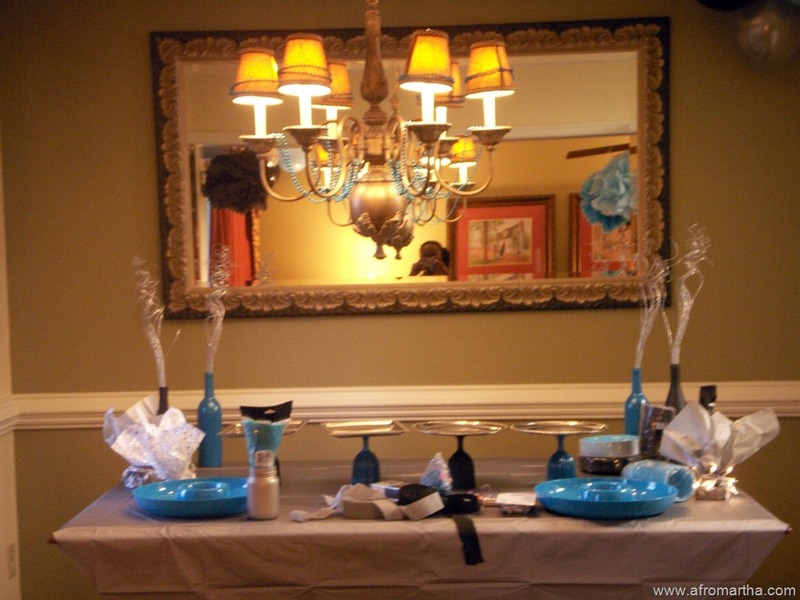 *An assortment of spray painted glass: Old sauce jars and wine glasses in the three colors. The jars hold plastic-ware, the Wine bottles to hold some spray painted branches used for decoration. 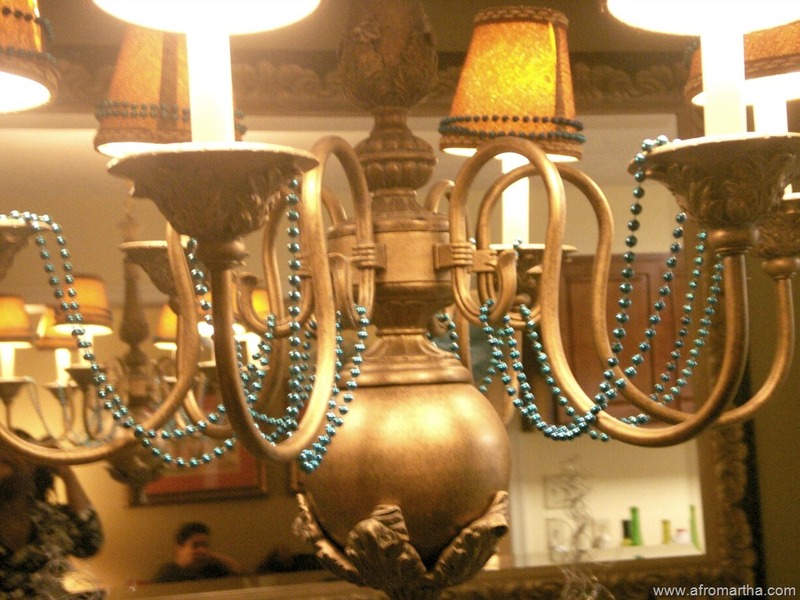 *Mardi Gras Beads, strewn casually over a chandelier, lamps or any other place you can. *DIY colorful party platters – spray paint heavy win glass or candle holders, glue with a silicone glue to the bottom of a tray. 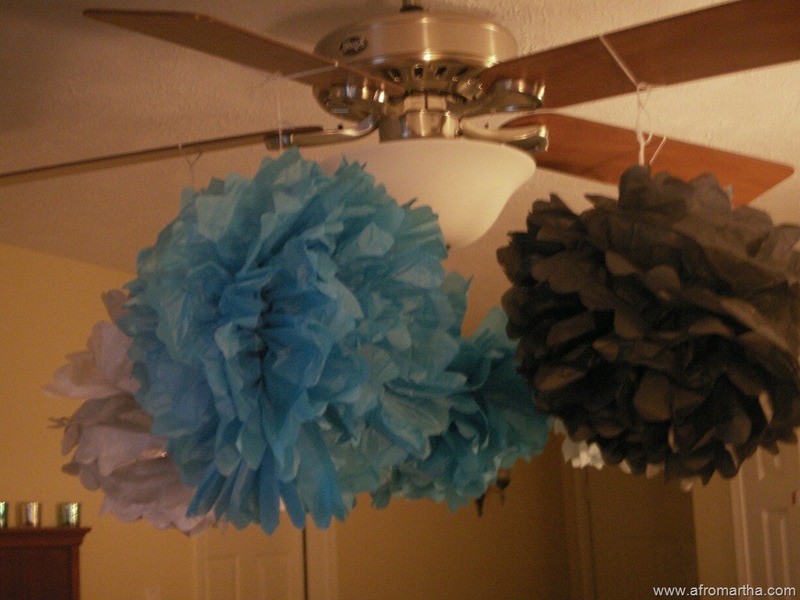 Tissue Paper pom-poms that I attached to the ceiling fan paddles. I turned the fan on to a very low setting during the party so that the poms swayed gracefully in a circle hypnotizing into a stupor anyone who started for more than a few seconds. I’m short, so I quite enjoyed the performance of the Poms. Mr. AfroMartha on the other hand, was annoyed by them, since they gently caressed the top of his head if he happened to walk under them. Luckily our guests remained seated, so it was only an annoyance for Mr. A. So if you decide to do this you might want to make sure you don’t make them too big, or that they don’t hang too low. Go here to learn how to make some. See those turquoise and black bottles in the pic below? A very simple and easy project that adds impact. All I did was spray paint 4 (empty) wine bottles and let dry. No sanding, no priming, just wipe down clean and spray paint. There were 4 bottles in all, 2 flat black, 2 glossy turquoise. And those bottles were “acquired” the 1 week before the party, because that’s how we roll. I made the “platters” by also spray painting 4 heavy dollar store wine glasses and gluing some dollar store metal trays to the stem of the glasses (turning the glasses upside down). The platters were just the right size to hold finger foods like mini-quiches and mini tacos. *CAUTION* DO NOT spray paint any thing that will come in direct contact with food. This could be poisonous. To complete the look and give some ambient lighting, I made luminarias (not pictured) by stringing battery operated string lights around some tissue papers and placing around the room. I also had a row of votive candles in faux-mercury glass votive holders (also not pictured). I so enjoyed the details of the party planning. If you have any pictures of your party décor or tablescapes, I’d love to see them! I love the color palette you used and all the elements. You have such a great eye for details. Don’t have any party plans in my near future (that I know of), but in my other life, I wanted to be a wedding planner. I didn’t even think I had an eye for the details until I did this party. I had so much fun planning it.